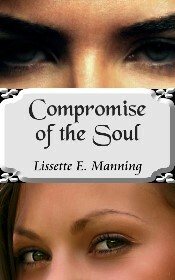 So without further ado, I present to you my #SaturdayStory, Compromise of the Soul. I hope you all enjoy what I’ve written. Reaching up to brush back a lock of dark hair that had fallen over her lover’s brow, Celia Waters felt her heart race as she gazed into his eyes. A knowing smile played about his lips as he bent down to brush his mouth against hers. “Open your heart to me,” he whispered, gently coaxing a response from her. He pressed a line of kisses across the expanse of her neck, nipping lightly as he did so. “Don’t fight me,” he said, the timber of his voice deepening as he sought to gain her acquiescence. The sound of something crashing broke through the fog of her desire and jolted her awake. She sat up, the sweat-soaked bed sheets plastered against her skin. Untangling her limbs from her silken prison, she slid off of the bed and blindly searched for the lamp’s switch. The tumescent glow stung her eyes momentarily. Grabbing the discarded robe that she’d draped across the chair that sat in front of her vanity earlier that night, she slid her arms into its sleeves. Tying its sash into a knot at her waist, Celia picked up the lantern that lay upon her chest of drawers and tentatively exited her room. The hairs on the back of her neck rose as she made her way down the darkened corridor. Something was amiss, but she knew not what it was. A sharp gust of wind arose as she neared the stair’s landing, extinguishing the lantern’s glow. A loud curse burst from her lips as darkness descended upon her, for she’d left the box of matches atop the cabinet. Not wanting to make the long trek back to her room in order to fetch them, she set the beacon down and carefully made her way down the staircase. Taking small, deliberate steps, she set off in the direction from whence the flow of air came. She found herself standing in the middle of her parlor, gazing at the scene that spread out before her eyes. The fenestella’s had been opened wide, the harsh winds causing the lace curtains to flap angrily back and forth. Marching forward, she grasped the window’s edge and slid it closed. Pulling the drapes into place, her hackles rose even further as she felt the brush of someone’s fingertips across the back of her neck. She whirled about in search of the intruder. Her eyes were not yet accustomed to the meager light and it was not enough to allow her the luxury of finding what she was looking for. “Who goes there?” she asked. A thick silence was her only answer. Wrapping her arms about her waist, she tucked her chin against her chest and moved forward in the direction of the fireplace. Try as she might, she could not dispel the notion that someone was in the room with her. Reaching out, she curled her fingers around the base of the fire iron and drew it close. A soft chuckle burst forth from the upper left corner of the room. She swallowed, knowing that she was not alone. Swinging the poker out in front of her, she knocked one of the lamps to the floor. Bits of glass cut into the skin at her ankles as it shattered about her feet. “Bloody hell!” she cursed, rooted to the spot for fear of trampling the broken crystal. Celia froze. She felt the color drain from her cheeks as she pondered his very words. There’s no way that he would know what I’ve been dreaming of, she thought. Is there? “I sorely doubt that,” she replied, her voice barely a whisper. She felt a slight yank upon the back of her head as the pins within her hair came loose. Her long, lustrous curls cascaded onto her shoulders as they clattered to the floor. The intruder lifted a fragrant lock and drew it towards his nose, inhaling the flowery scent that accompanied the silken tresses. Her eyes closed of their own volition as he turned her around and crushed his lips against her own. He dug his fingers into the soft flesh of her hips, unable to stop himself from dropping his compulsion and delving into the deepest reaches of her mouth. She struggled against him as the fog lifted and she became cognizant of his actions. Pushing hard against his chest, she disengaged herself from his embrace. Her feet slipped across the wooden floor, a shard of glass embedding itself within her heel as she backed away from him. The scent of her blood assailed his senses, breaking through the murky haze of his longing. Cursing loudly, he ignored the sudden pang of hunger and drew upon his powers of coercion to ease her trepidation. Her eyelids drooped closed as he bent down to wrap his arms around her. He carried her towards her room, fighting the ache that arose as he continued to yearn for her blood. Depositing her onto the edge of her bed, he rummaged about within her chest of drawers in search of something to staunch the flow of blood. Ripping apart one of her camisoles, he returned to her side and carefully extracted the glass out of her heel. He bandaged it as best as he could and settled her back upon the bed. Leaning towards her, he whispered several words against her lips and gently tucked her into bed. Her eyes began to close even further as he wrapped the duvet about her shoulders. Glancing down at her with regret, he strode towards her window and flung it open. Pulling himself onto its ledge, he slid it closed behind him and dropped to the grounds below. He soon slunk into the shadows, leaving her behind. Sinking into the deepest throes of sleep, she rolled onto her side and curled her arms about her pillow. Her mouth parted to whisper a name belonging to the one person that would haunt her forever. This entry was posted in Books, Chapter, Excerpt, Fiction, Paranormal, Preview, Romance, Sample, Story, WIP and tagged Books, Chapter, Compromise, Compromise Of The Soul, Excerpt, Of, Paranormal, Preview, Romance, Sample, Soul, Story, The by LizzieBeth. Bookmark the permalink.